Southern California is renowned for its sun, sea and surf, and Los Angeles is no exception. Embrace the surfing lifestyle embedded in the culture down in Surf City or arm yourself with local insider tips and go in search of L.A’s best waves, with plenty of surf shacks, hip bars and chilled out eateries thrown into the mix. Every year, over half a million people flock to Huntington Beach for a week of big waves and jaw-dropping manoeuvres at the Vans US Open of Surfing. First held back in September 1959, this annual event has gone on to become the world’s biggest surfing competition and always features some of the finest male and female surfers on the planet – all keen to show off their skills in the ‘surfing capital of the world’. Huntington Beach, better known as ‘Surf City’, epitomises the California surfing culture we all know and love. Surfing is a way of life here, from the Surfing Walk of Fame on Main Street to the hundreds of boarders descending on the beach at sunrise to catch the early morning breaks. And best of all, you don’t have to be a world class surfer in order to fully embrace the lifestyle. What does help, however, is a pointer or two from people in the know, so we teamed up with some local experts to bring you the lowdown on the very best spots in which to find your surfs, chills and thrills in and around L.A.
We got in touch with the fine folks over at Spinlister; a sharing website that facilitates peer to peer equipment hire – be it for surfing, biking, skiing or boarding. The ethos of the company is to enable visitors to experience a town or city like a local, with plenty of tips and guides available through their sharing site and app (available on the iTunes Store). It’s also cheaper than a store rental, with a full day’s surfboard rental setting you back little more than $20 on average. Their headquarters also just happen to be in Santa Monica, where all staff partake in an early morning bike ride or surf before arriving at their desks. In other words, they’re ideally positioned to dish out some top local surf tips. In order to best showcase L.A’s finest surfing spots, we’ve also teamed up with Ronald and Oreon from Oreon Photography; two L.A based surfers specialising in film and photography. They kindly agreed to hit the road and create a mesmerising ‘Road to Huntington Beach’ video highlighting the very best surfing locations in and around L.A. Read on to check out the video and soak up all the local insider tips for the ultimate L.A surfing vacation. Beach Break refers to beaches where the waves break on the sandy seabed. These are ideal conditions for beginners, thanks to a smooth seabed with no rocky points. Point Break is the term for waves that break on rocky points and tend to be more suited to experienced surfers. Reef Break refers to waves breaking over coral reefs. They tend to be some of the best waves going, albeit carry more risk should you fall off the board and get swept into the rock face. Left Hand/ Right Hand are the terms used to describe the direction from which the wave breaks from the point of view of the surfer. A wave breaking from right to left is known as Left Hand, with Right Hand being the direct opposite. Peak is when a wave breaks from both directions, enabling multiple surfers to ride it simultaneously – albeit in different directions. Frube is the name given to a surfer who fails to catch a single wave whilst in the water. You don’t wanna be that person. Now that you’ve brushed up on your surfing terms, it’s time to get the lowdown on the best places to show off your skills – starting with Surf City. Huntington Beach stretches for over nine miles along the Orange County coast, just a short drive south of L.A along the Pacific Coast Highway. Surfing is part of the fabric of this city, where the Huntington Beach Pier runs from the foot of Main Street and out over the Pacific Ocean. As Curren Bates from Spinlister explains, the pier also acts as a marker for the beach’s best waves. “The pier has a consistent mix of fun waves 365 days a year. With the consistency comes the crowds, but the vibe is mellow and there is plenty of room for you to get some waves. Both sides of the pier are good, with the South Side being the better of the two. “Heading north you can find plenty of beach breaks ranging in size and consistency. Bolsa Chica can get really fun with waves all over but be wary of the current. For some more really fun waves head to The Hole or Surfside Jetty; parking here can be a pain, but on the plus side it’s less crowded and it’s a quiet escape from the main beach of Huntington,” says Bates. 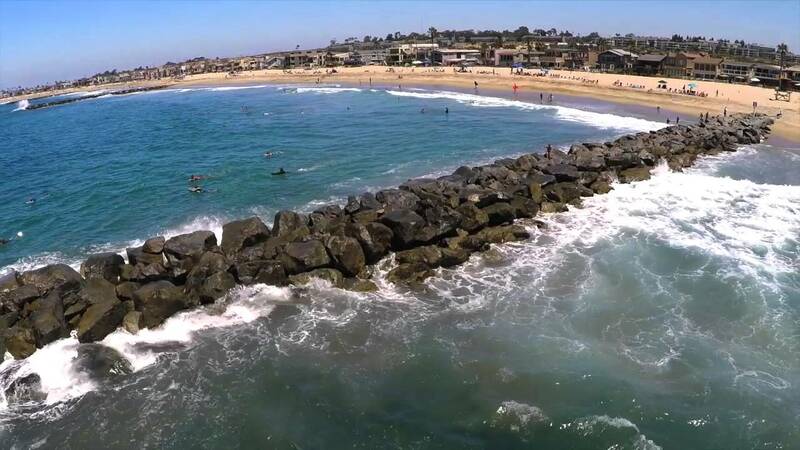 The Santa Ana river mouth to the south is another popular spot, whilst Bates also recommends doing some Stand Up Paddling (SUP) around Huntington Beach Pier. SUP is an increasingly popular sport which originated in Hawaii, and essentially involves standing upright on a surf board whilst using a paddle to navigate your way across the surface of the water. How you use it is up to you; some people sign up for SUP races, while others simply see it as a relaxing way to spend time on the water. Regardless of where you to choose to launch your board, a day spent riding the ocean waves will certainly help build up your appetite. So where do Surf City’s residents go to refuel? “TK Burgers is one of the most consistently packed places by the beach; the burgers here won’t let you down and it’s a must-go when in town. Chronic Tacos is another cult favourite as well, whilst a ten minute drive south takes you to Bear Flag Fish Company in Newport – here you’ll find the best fish burritos in the world. You won’t be disappointed,” Bates says. For a caffeine hit, try Bruxie on 5th Street or venture south to Newport Beach for great coffee and chilled out vibes at Alta Coffee. If you’re keen to fit in with the hip local crowd then head along to two of the city’s top surf shops; Jacks and Huntington Surf and Sport, for all your surfing needs. Once the sun sets, Huntington’s Main Street is the place to be thanks to its wide selection of bars and restaurants. Bates recommends the likes of Zimzala, 25 Degrees and Baja Sharkeez. There are roughly 20 beaches located within the Los Angeles County area alone, meaning it can take years to build-up knowledge about which stretches of water offer the best surf at certain times of day. Unless of course, you tap into some local expertise. So once you’ve lived it up in Surf City, which L.A hot spots can you not afford to miss? “The trick is finding the diamonds in the rough, and that’s where local knowledge comes into play,” says Bates. His personal favourites are Sunset and Venice Beach, which sit either side of Santa Monica, plus Redondo Beach which is located further south near Manhattan Beach. “Redondo and Venice are your classic beach break/jetty setups and can be hit or miss. However, for the most part they are playful with more waves than other L.A spots. They also tend to be less crowded, which is always a bonus. In Venice, the people-watching is excellent, but be wary of the locals in Redondo as some of them can be a bit rough around the edges,” he says. He also recommends Sunset Beach, which he describes as Malibu’s little brother. Its lack of crowds and potentially great conditions are characterised by mellow, slopey waves, which are ideal for all types of surfers. For some insider tips, however, it all comes down to who you know. Follow the Pacific Coast Highway some 17 miles west of Sunset Beach into Malibu where a hidden, albeit private, jewel awaits. “Top tip? Become friends with someone who has a key to Little Dume. This is a private, residents-only point break with a guard at the beach access point. Hit the waters here and you can catch a perfect right-hander that reels for yards and yards, plus the beach has the view and the waves to make it a must-visit if you can get access,” says Bates, whilst adding that any type of board will do when surfing at his favourite L.A beaches. Venice Beach is one of the hippest areas in L.A and is renowned for its street artists, performers and quirky shops. As far as people watching goes it’s second to none, be it by the outdoor weightlifting area known as Muscle Beach, or the basketball courts where crowds of people gather to shoot some hoops throughout the day. Oh, and there’s also the beach itself – complete with ‘Baywatch-style’ lifeguard towers. Nothing beats a refreshing drink after a day’s surfing and, needless to say, Bates has a few recommendations up his sleeve.